Circa 1806-1819  John Blocker, Jr. built a plantation house on the property (6). 1825  John Bones purchased the plantation (3, bk. 1, vol. XI: 43). 1831  John H. Hughes married Martha Bones and the couple raised their eight children at Cedar Grove (9).
?  Sallie Mae Nicholson acquired the property. She is a descendant of John Bones (3, bk. 1, vol. XI: 43). 1973  Sallie Mae Nicholson passed away. Cedar Grove was sold to Dr. & Mrs. James M. Hawk, DVM (8). 1987  The plantation was purchased from the Hawks by Mr. & Mrs. John C. and Sandy Whitehouse. The Whitehouses completed extensive renovations to upgrade the kitchen at Cedar Grove and operated it as a bed and breakfast (8). 1995  Cedar Grove Plantation was featured in the December edition of Victoria magazine as Sandy Whitehouse was an accomplished chef (8). 2002  The Whitehouses decided to retire and sold Cedar Grove to Dr. & Mrs. Arthur B. Chandler. 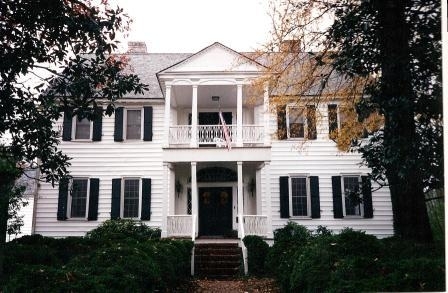 The Chandlers resided in Augusta, GA and used the plantation as a weekend getaway home (8). 2007  Ms. Collins Daye purchased Cedar Grove from the Chandlers (8). Original kitchen and slave quarters are still standing. Information contributed anonymously on behalf of Cedar Grove Plantation.